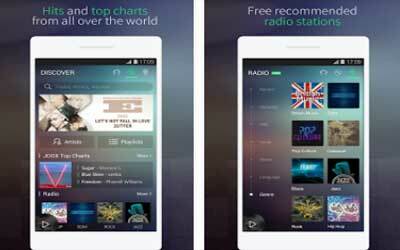 Music streaming now exists in your hand through JOOX Music APK 2.5. All the music lovers now close to the bank and library of music that is widest and largest. Forget about store so much music tracks in your memory card. It will drain your storage space. Somehow, you will not play the entire music you store, is not it? So, music streaming is the answer. You can explore and look for your favorite music track here. It does not only available to be heard. You can even save them through download button if you want. Therefore, offline play will also very possible. More than that, by opening JOOX Music, you will be offered by the special playlist made by the editor of JOOX. As you wish, you can be able to boost the atmosphere around by the music you heard. You can have the music you want almost anywhere anytime. Lots of features are added to make the users satisfied with the app. It includes the huge sized library. All the music stored comes from all over the world. There are no hidden or restricted music here. If you want some music and information, just access the JOOX radio. It will give you 50 channels availability. Sometimes, we want to hear a song without knowing the place to look for. So, the recommended playlists are the good stuff for you. It has so many track recommendations for you. The presence of the music track also allows the user to made personalized version. Keeping the track is capable by making the playlist. Do you happy enjoying a new music to hear? Share it with your friend through the real time sharing options. With its high quality of song, JOOX Music for Android is pretty recommended for you who want to play music on demand.